A member of the Burke family who did not appreciate the sentimental and historical value of the photograph sold the original tintype as many as twenty-five years ago to an unknown person or persons. At the time of this transaction, the identity was lost. At some point the family received a photograph of the original tintype. This copy print was made with a non-digital camera not from the original, but from a reproduction printed in some publication, perhaps a book. The family has come to think of this copy print as the original photo of Nimrod Burke. This copy print has since been scanned and uploaded to Henry Robert Burke's web site. The tintype was sold at some point to noted collector Herb Peck Jr., a Nashville, Tenn., photographer who worked in Vanderbilt University's Department of Fine Arts. This was one of Peck's first purchases in the early 1980s after his original collection was stolen. A year or two before his passing in 2004, he sold it to Tim Kernan. This scenario is subject to revision as more information is obtained. Also unresolved is a uniform issue: Burke is listed as having served as a sergeant during his enlistment. The soldier pictured here wears a corporal's chevrons. I'll be checking Burke's military service records at the National Archives to determine if he ranked as a corporal and sergeant. Nimrod Burke stares into the camera, dressed in his army uniform complete with corporal's chevrons and holding a revolver. 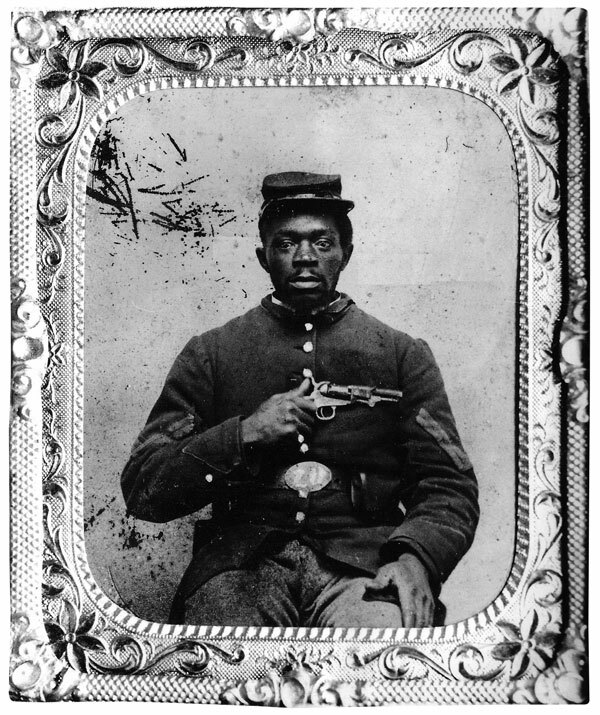 Burke, a soldier in the Twenty-third U.S. 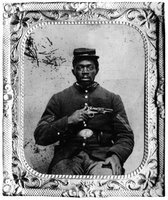 Colored Infantry (USCT), is the great-great grandfather of Henry Robert Burke, an author and historian in Marietta, Ohio. Some years ago, Burke arranged to have a photograph made of the original image of his Civil War ancestor. A scan of this photograph is pictured here, and on a web page profile of the veteran. The original image, which appears to be a sixth plate tintype, was owned by Burke's cousin. Today, the location of the original photograph is unknown. One possible scenario is that the image was purchased by or given to well-known collector Jerry Duvall. On Duvall's passing, his collection was quickly dispersed. This photo may have been sold to a coin collector, at auction, or at the Ohio Civil War Show in Mansfield. I suspect the image is in the hands of a private collector who may or may not know the name of the soldier. The leads I've pursued have dried up. If you know of the whereabouts of this original image, please let me know. I want to use this photograph in my forthcoming book, but am unable to do so without permission from the owner.